The Buick Enclave is a four-door and up to eight-passenger sport utility vehicle. 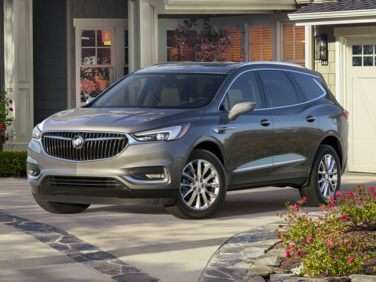 The Buick Enclave is the latest of GM’s new crossovers to be introduced. We were first given a glimpse of this luxury SUV concept during the 2006 North American International Auto Show in Detroit. The Buick Enclave comes in CX FWD, CX AWD and CXL FWD, CXL AWD trim levels. It is one of the larger crossover SUVs on the market. It has standard seven-passenger seating offering captain’s chairs in the second row and a bench seat in the third row. If you need to increase the capacity to eight you can switch out the captains' chair for a second bench at no extra charge. Of all the Buick lineup, the Enclave is one most deserving of the Luxury label. The interior of the Enclave is huge compared to others in its class. Not only can it carrying loads of people but it also offers 116 cubic feet of cargo space. The backseats have a 60/40 split, with the third row of seats folding flat. If you choose to have two bench seats in the back, both of them can be flat folded as well. Standard for all the Buick Enclaves is cloth upholstery and a beautiful wood grain trim. If you go up a step to the CXL model, there are leather seats. The whole impression is one of time taken to do a job right. It’s artistic and serene. There are still a few things covered in vinyl or made of plastic that sets it lower than other luxury models but all in all – it’s a good job. Under the hood, of the CX model, regardless if you choose front-wheel drive or the all-wheel drive, there is a 3.6 L V6 engine that produces 288 hp.. This is matched to the standard six-speed automatic transmission with overdrive. An added advantage to the Enclave is its towing capability. This vehicle has can tow up to a maximum of 4,500 pounds. The CX trim offers 18-inch alloy wheels, telescoping leather/wood steering wheel, an bi-xenon HID headlights, power liftgate, heated mirrors, power driver seat, six speaker CD stereo with MP3 player input jack, as well as OnStar. Going up a step to the CXL adds in 19 inch wheels, leather upholstery, extra adjustments on the front seats, including memory for the driver seat and heated front seats. There are many options available for the 2009 Buick Enclave as well as four Entertainment packages, two Driver Confidence packages, CX Base Package, Rear Seat DVD, and Hit The Road Package. There are also standalone options like the Dual SkyScape Sunroof, extra storage console for the second row, power telescopic steering column, dual skyscape sunroof, and towing extras. When it comes to safety, the Buick Enclave is no slouch either. It comes standard with antilock disc brakes, front seat airbags and curtain airbags for all three rows of seats. Also included is a tire-pressure monitor and stability control with anti-rollover logic. For backing up there are optional rear parking sensors and if you end up with a model that has a navigational system, then it comes equipped with a rearview camera.